Episode 121 - Does Everyone Have a Conversion Experience? Do you have to have a conversion experience in order to be a Christian? A couple of weeks ago I did a podcast on the fact that there's a heart behind every question, that often what seems to some, and often to me, as just an intellectual question, really has something that's deeply heartfelt behind it. The person perhaps asking about works, and salvation, or eternal security, or you fill in the blank, often isn't just trying to satisfy some intellectual curiosity. They have something that's troubling them emotionally, and existentially. Well, one of the examples I gave was of someone asking, "Do I have to have a moment? Do I have to have kind of a Damascus road experience where I was uniquely and powerfully aware of coming to Christ?" Well, since that episode I've had some more conversations where that topic have come up and people have asked me to provide more details about that. I figured it'd be helpful for us to cover that today. Do you have to have a moment? Do you have to have a time where you became distinctly, or let's say, powerfully aware of becoming a Christian? I'm going to say, no. You don't have to have such a moment. I want to establish a few things as we work towards an answer here. The first thing to point out is you're either a Christian or you're not. There's not a middle ground. For instance, in 1 Corinthians 1:18 Paul says, "That the message of the cross is foolishness to those who are perishing, but to those who are being saved, it's the power of God." One message, two groups. There's no middle ground. You're either perishing or you are being saved. In Paul's vernacular, that would be someone who's a Christian and who's ultimately being perfected unto the time they die, and are glorified, and are with Christ. You're either a Christian or you're not. Romans 8 says people who are in the flesh cannot please God, but if you're in the Spirit, you can please God. No middle ground. Once again, you're in the flesh or you're in the Spirit. You can't please God or you can. No middle category. The reason I'm bringing this up is to show that there's not kind of like a,” you're an almost Christian, you're a kind of Christian.” You either have been regenerated by the Holy Spirit or you haven't been. God has either taken out that heart of stone and put in a heart of flesh or he hasn't. You're either dead in your sins or you're alive in Christ. There is the reality of the fact that at some point for everyone who becomes a Christian or is a Christian, there will be a time when you were not a Christian and in the next instant you are a Christian. When the Holy Spirit does that wonderfully transformative, glorious work on your heart and in fact, your nature, and in so many other things, that happens at a specific point in time. It's not a gradual process, it's a decisive act of the sovereignty of God. However, in spite of the fact that that is a decisive act at a point in time, our knowledge of that, our apprehension of that, may not actually line up with that event. I see nothing in scripture that leads me to believe that the Christian should expect an experience in coming to Christ. Now, yes, in Acts at that transitionary point when the Holy Spirit has come, new people are included in the covenant. That transition and the apprehension of the Holy Spirit is marked by a sign, the speaking of tongues, and miracles, and other things at that point, but there's nothing in the text that leads us to believe this should be the norm for the Christian today. Often also, the conversions that are described in scripture are for adults when there is a conscious shift that happens from someone who is opposed to Christ in their thinking, to someone who makes a conscious decision to submit their life to Christ, to repent of their sin, to repent: to change their mind about who God is, who they are, and all those types of things, and to place their conscious trust for salvation in Jesus. For the adult, it's easier to point to a time, often times. However, I don't think our knowledge of this event, our self knowledge, always lines up with the event. For many people, this is actually more troubling if they came to faith as a child. For the person who grew up in let's say a Christian home, a home where the gospel was preached and proclaimed, the scriptures were read, where Godly morality was taught, those types of things, such a person who grew up in that environment may not have a point where they had this decisive turning point. They may have always grown up believing the gospel is true. They may have always grown up believing that God exists. I would say, honestly, that's an awesome thing. That's a gift by the grace of God. My point is, is that person may not know when the Holy Spirit took out that heart of stone and placed in them a heart of flesh. They had always been participating in a Christian lifestyle with Christian intellectual commitments and they may not be aware of when that event happened. Now, the event happened, or they're not a Christian, but they may not be aware of that. I think we actually do damage to people and to some theological ideas, when we heavily insist that someone must know the date and the time. Because that really puts the emphasis on me and when I said a prayer—that's when I became a Christian. That's what it actually comes across as sometimes. Actually, theologically you couldn't have prayed the prayer unless you were a Christian. The person who's in the flesh can't please God. Repentance is pleasing to God. Therefore, repentance as we see in the New Testament, is actually a gift. Just like faith is a gift. We repent after we have been regenerated, or as a part of that you might say those two things happen kind of coincidentally, but there is kind of a logical order there. My point here is that many people will not be aware of the moment when this happened. When was their trust actually was saving trust. I think we should not push that point too far. Also, when we do push for a date and a time, we're kind of emphasizing this idea that just praying a prayer makes someone a Christian, and it doesn't. I was asked one day at church Why we don't often give people a sample prayer to pray so that they could just become a Christian right then and there, because if we suggest that they go to the care room and talk with someone, well, some people won't go. One question I asked the person is, "So, are you saying that if they're serious enough to pray a prayer, but they're not serious enough to walk to the care room and talk with someone, that they actually want to be a Christian?" That didn't make much sense to me. Beyond that, often times if we just give someone a prayer to pray, they don't understand what we would mean in that prayer. Like, what does it mean for God to be holy and creator? What does it mean for me to be made in his image and yet sinful and fallen? What did it actually mean for Jesus to die a substitutionary atoning death on the cross? Those phrases have meaning and often people who just want a prayer or are just told a prayer, don't understand what they're actually saying. The words aren't magic, and we shouldn't convey that they are. That's a concern there. If you just prayed a prayer when you were younger, perhaps, does that mean you got saved then? Actually, I would say no, right? Though, you have have been. This goes back to our idea that our conscious knowledge of being a Christian or having prayed a prayer doesn't necessarily align with when we became a Christian. Could you have been a Christian quite a while before you prayed a prayer? Yes, certainly. I do believe that's the case. I also think there are many people who have prayed a prayer and are not Christians. What we see often times is someone will say, "I prayed a prayer 20 years ago," and yet their lifestyle and the fruit, or lack thereof currently, looks like the type of lifestyle that Paul in 1 Corinthians 6 would say means you are not a Christian. I think that is something we have to contend with, that simply praying words, simply saying certain things, doesn't make you a Christian. We have to have room in our theological systems for Matthew 7, where people will come to Jesus and say, "Lord, Lord, didn't we cast out demons in your name and do wonderful things in your name?" He's going to say to a certain type of person, "Go away from me, I never knew you." They were trusting Jesus, but they weren't actually Christians. We've talked about this before, but I do think it's helpful for us to understand that our conscious knowledge of the fact that we have surrendered to Christ may actually come after the fact that we have surrendered to Christ. In fact, in order to pray a prayer of surrender to Christ, I would say you have had to already surrender to Christ. I think that's helpful for us to think about. Some people might say, "Well, did I do it wrong? Did I pray the prayer wrong? I mean, I know so much more now and I think, 'Gosh, what was I actually saying or committing back then?'" I don't know that that's a helpful question. I think the current question is: are you currently trusting Jesus for your salvation? Not your works, not your heritage, not tradition. Are you trusting in Jesus alone for salvation? Do you repent of your sin? It's been said that when the Holy Spirit pricks your heart, do you bleed repentance? That's a good indicator of whether someone is a Christian or not. When they're confronted with their sin from scripture, by the Holy Spirit, by a friend, or by the church, do they repent, or are they hardened against it? Now, that's not a surefire indicator, but it is a pointer for us. The New Testament doesn't aim to give anyone assurance of salvation who is not repenting of their sin. I mean, 1st through 3rd John makes that quite clear. Why am I talking about this? Well, I think there is a group of people who have grown up going to church, in Christian households, and don't have a moment. They can't point to a date and a time where they became a Christian, but they would fall in that category of a person who trusts Jesus for salvation currently, not their works - no other God, not something in addition to Jesus. They repent of their sins, they care about those things. They care about living for the glory of God. That's a much better indicator of if someone is a Christian than if they prayed a prayer 30 years ago. When we push for a prayer and a date, we actually do damage to some theological commitments, some Biblical teachings, where words don't have power, where faith is actually a gift, where repentance is a gift. It also kind of obscures the fact that people can claim the name of Jesus, but not be Christians. Matthew 7 talks to this. James speaks to this. This was the whole idea of people having an intellectual commitment or assent to who Jesus is, but James is saying that they don't have saving faith. The type of faith they have is not saving faith, because it isn't evidencing fruit and works. You're not saved by works, but saving faith does produce works. We have an order there that's important. Nonetheless, I just think these types of things are important to think about and to speak clearly about. I have a friend who grew up and never had one of those experiences where he went away from God and the church and came back and that type of thing. That's an awesome type of thing. That's actually my prayer for my daughter who's not even born yet, that she would grow up in a house where the gospel is modeled. That's a high level of responsibility for my wife and I. That she would grow up in that environment. That she would grow up believing that God exists, trusting Jesus is who he says he is, and at some point through all that process that she'll actually end up being a Christian. Now, will she know where that moment is? No, she very well may not and that's not a bad thing. What's important is that she grows up and that we all, wherever we are, whatever our stage of life, wherever on that process of sanctification or whatever we are, that we all trust in Christ for salvation alone. That's incredibly important. Our conscious apprehension of that may very well differ from when the event happened, but that's not a bad thing. I hope this has been helpful. I think many people will be surprised one day to learn they were actually Christians before they thought they were, long after they thought they were, or sadly, not at all. I think for some people having clarity on this idea can bring peace. It should also influence how we talk about this, that having said a prayer doesn't make you a Christian. What makes you a Christian is God's decisive act of taking out the heart of stone and putting in a heart of flesh. They're only two categories of people, you're one or the other; you're in the flesh or you're in the Spirit. You're either dead to sin or you're alive in Christ. It is God who does that work? Yes. Does that happen through repentance and faith and by an act of grace? Yes, it does, but we won't always be aware of when that happens. 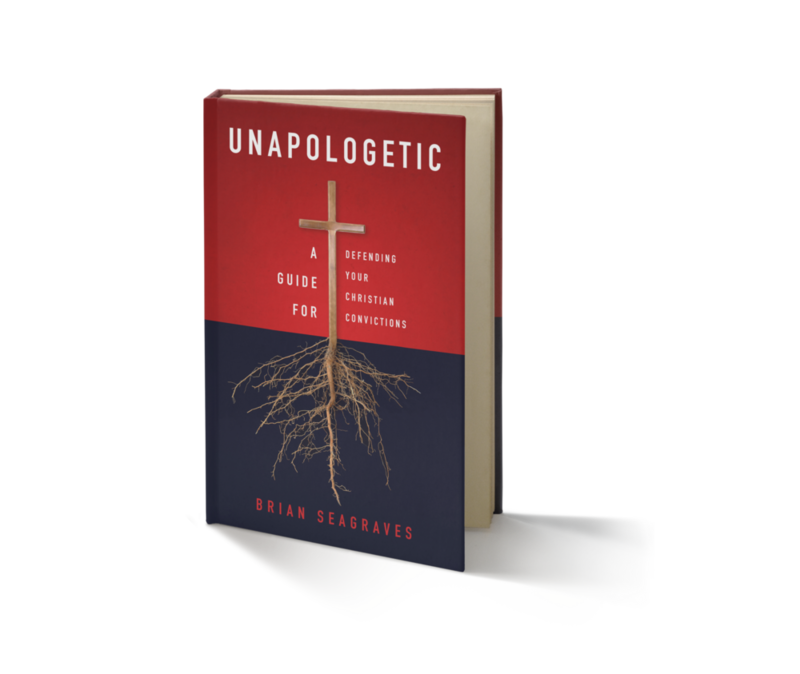 I'll talk with you next week on Unapologetic. Older PostEpisode 120 - Is there a Blatant Contradiction in Proverbs? Here are the books I read and found helpful from 2018. Design your own chronological reading plan to fit your needs and schedule! Get new content delivered to your for free!